Norman Samuels picks Ginger Gold apples for Ricker Hill Orchards on Perkins Ridge Road in Auburn on a recent morning. Ricker is one of the orchards participating in Maine Apple Sunday today. Today is Maine Apple Sunday, an event sponsored by the Maine State Pomological Society with participating orchards around the state. The day coincides with the peak of the apple harvest when summer apples are still available but the main crop is ready for its first pick, according to the society. 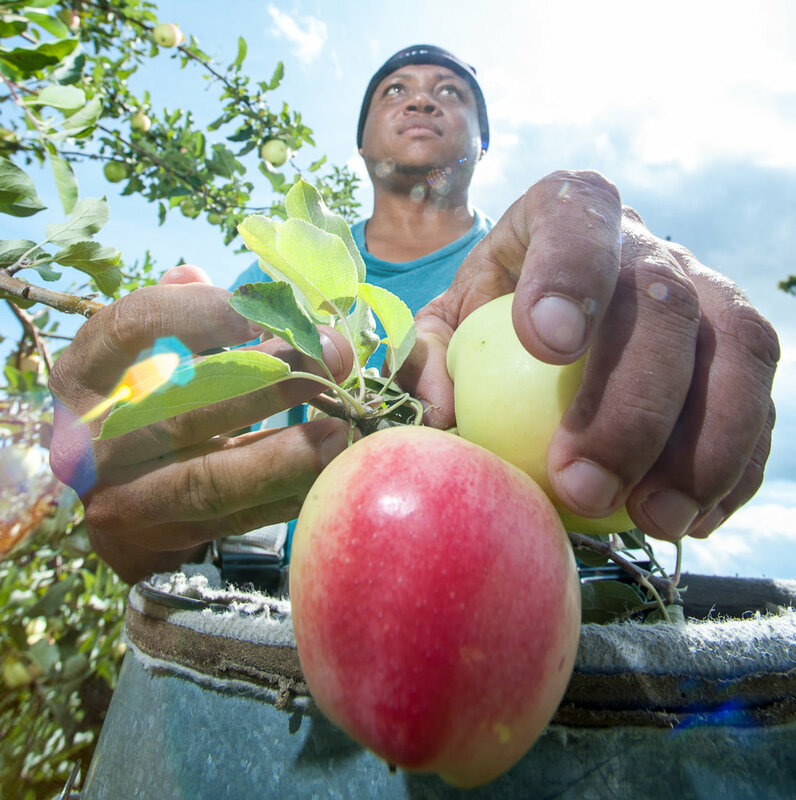 Participating orchards offer special activities, samples and more during the day. * Bailey’s Orchard, Whitefield. Free apple squares, door prize drawings. * Boothby’s Orchard and Winery, Livermore. Music by Lindsey Montana, free wagon rides, orchard and winery tours, sweet cider and cheese samples. * Hansel’s Orchard, North Yarmouth. We will raffle a peck of apples and offer free samples of our favorite apple recipes. * Libby and Sons U-Picks, Limerick. Free Live Music, balloon Characters, Magic Tricks and Face Painting($) as well as free samples of Apple Jam, Apple Salsa and Apple Pie Smoothie (while supplies last). * Maine-ly Apples, Dixmont. Free hayrides, BBQ lunch prepared by the Dixmont Rescue Squad, free samples and apple picking. * McDougal Orchards, Sanford. Raffle tickets will be distributed to each paying customer, with drawings at the end of the day for numerous apple related items. * McElwain’s Strawberry Farm, Caribou. Hayrides through our orchard to the u-pick pumpkin field, apple tasting, a kids straw bale climbing pyramid and Cinderella’s Pumpkin Coach. * North Star Orchard, Madison. Sample ice cream with our own special apple pie topping. * Pietree Orchard, Sweden. Apple samples, wagon rides, PYO, hay maze and more. * Ricker Hill Orchards, Turner. Live music and food truck, U Pick apples and farm activities, bounce houses, corn maze and a special on carbonated sweet cider. * Spiller Farm, Wells. Hayrides, games, and animals to view. * Sweetser’s Apple Barrel and Orchards, Cumberland. Free apple crisp samples, heirloom apples on display. * The Apple Farm, Fairfield. Wagon rides, samples of our jams, jellies and other goodies. * Thompson’s Orchard, New Gloucester. * Treworgy Orchard, Levant. Free Hay rides. Our corn maze, petting zoo, pumpkin patch, cafe and gift shop will be open. * Wallingford’s Fruit House, Auburn. Hard cider/ wine tasting, Upick apples, corn maze, donuts and baked goods available with a special on sparkling sweet cider.